Chromium is the Open Source part of the Google Chrome browser basically. It is a standalone browser that runs very well on its own, and some users prefer to use it for a variety of reasons. To name some: it gets updates first before they are added to the four Google Browser versions canary, dev, beta and stable. Another aspect is that it is completely Open Source without proprietary code, which means that all the things that Google has added to Chrome, are not found in Chromium. One problem that users who work with Chromium experience is the inability to update from within the browser. Unlike Google Chrome, which comes with built-in updating options, Chromium offers no such option which makes it hard to update the browser, especially since it is usually updated several times a day. The following programs are designed to automate the process, or make it more comfortable at the very least. The free program ships with a highly configurable ini file. It will download the latest version of Chromium by default, or update it if it is already available. The program supports several different builds of Chromium, and several advanced features which you configure all using the ini file. 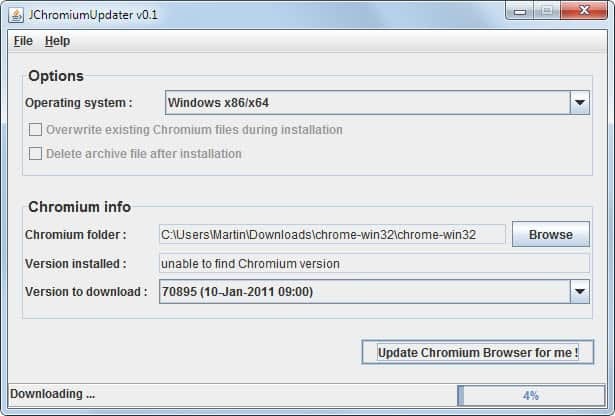 Chromium Updater is a Windows only application that can update an installed version of the Chromium browser. 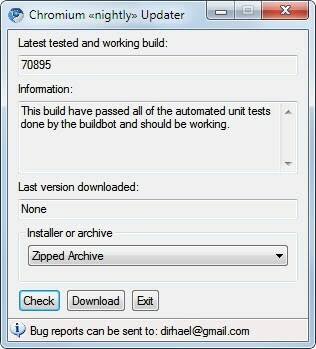 The software detects the installed version automatically, and downloads the latest available snapshot from the official Chromium server. If Chromium is not installed it will install the latest version on the computer, and update it from then on in consecutive runs. 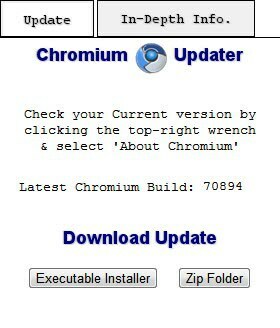 Chromium Updater is available at the project website at Google Code. Note: The program website is no longer available. We have uploaded the latest working version of the program to our own server. The program runs fine at the time of writing this update (March 2017). The updater is just a few days old and an early version has been released by the developer. The Java based application is compatible with all operating systems that Chromium is compatible with. It currently seems to only work with installed versions of the browser as it fails to update portable versions even if the right installation directory is selected. It will place the downloaded browser in the selected folder so that it is possible to update the browser manually. The software detects the operating system automatically and selects the latest Chromium build for download and updating. The project is actively developed and one to look out for. Downloads are available at the project website. Another Windows only application that can scan the official release server for the latest version and download it from the official server as a zip archive or executable installer. It will not update the Chromium version on the other hand, leaving that task to the user. Chromium Nightly Updater is available at DCmembers, a Donation coder service website. This is a simple Windows program, also available as source code, that will update Chromium if found on the system. If not, it will download the latest version of Chromium to the computer system, and update it from that moment on. Did we miss an option to update Chromium? If so, let us know in the comments. The following projects are no longer maintained. Chromium Updater is an extension for Chromium that offers to download the latest zip or executable build from the official Chromium server. While it is not able to update the browser, it is the only option to check for new versions with a browser control. 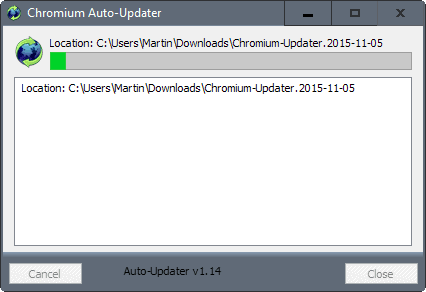 Chromium Updater can be installed in all versions of Chromium that support extensions which means that it is another cross-platform option to download the latest update. Chromium Updater -- last updated in 2013, it is no longer maintained. Crupdater -- last updated in 2016, the project has been abandoned. Which of the programs should you use? 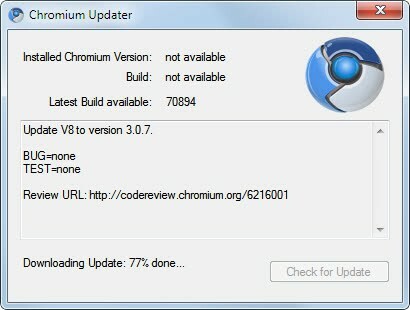 Chromium Updater appears to be the most mature one, but it is only available for Windows. If you use Windows, try this one out first. If you do not mind using Java, then JChromium Updater is the next best choice, as you can use it to overwrite your current installation to update Chromium to the next version. The other two programs will only download the program but not install it automatically. This guide provides you with an overview of programs for Windows that enable you to download and/or update the open source Chromium web browser. Given that Gnu/Linux installations can use the chromium-daily updates (chromium-daily ppa for *buntu) this tens to be of little use in that environment. Interessant, gilt das auch für die jeweilige englische Version? Kannste mal nen link posten? Ich füge das gerne hinzu. Deine Version ist auch für Chrome und nicht für Chromium. Bis vor kurzem habe ich noch den Installer von PortableAppz genutzt – leider kam bisher kein Update heraus. 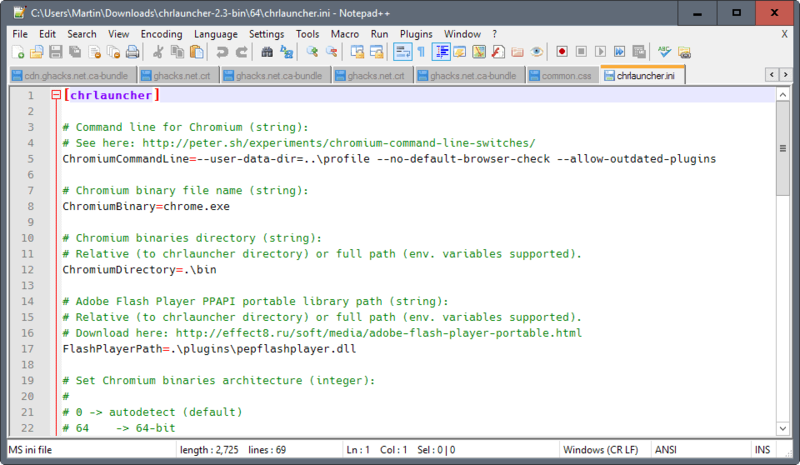 Der InstallerChromium_Portable_Latest_Online_Multilingual.paf.exe leistete immer gute Dienste, da dieser auch gleichzeitig als Updater funktionierte. Einen Ersatz gibt es scheinbar nicht, da alle Updater eine installierte Version voraussetzen. Schade. @Conditioned: Thank you very much for the hint – didn’t know, that mulder made something. That solves my problem :). Should be included in the list here at ghacks – Chromium made it to the browser of my choice. Firefox runs too, but … the speed and the usability of Chromium – perfect. You´re welcome. Yea I remember it took some time before I found it so no blame here on not including. Whats nice about it it doesnt require user interaction like the others. The only thing: It requires admin-privileges to run it. I tried it at my work – no chance without take the ownership of the admin-acc. Tried several ways – no chance. But for home: Very good. This is a mod of mulders 1.06 updater. • No autoopen the changelog-url after successful update (if you run Chromium portable, then you always have to close the window, because if no protable-loader will be executed, a normal profile will be created. I removed this option from the script). Completely automated. Now, if there is no update I have to answer a question as to whether I want to update or not. Setup a task, which executes the updater. The options should be clear :). Hope, this could help you. When running the modified version of Mulders chromiumupdater userinteraction is needed in two cases. 1.) if the version installed is the same version thats the latest on the server. You have to click cancel AND close the program. 2.) I run it on boot. If it takes too long to get an ip (I´m also running a vpn on boot) it cant find a server and needs userinteraction. So I wish there would just be some way to pre-answer the userinteraction so I would never have to see the questions. Guess I can dream on :) I´d do it myself but I cant code my way out of a shoebox. • If the version installed is the same version thats the latest on the server. You have to click cancel AND close the program. Sure, but you can setup, that the application will close automatically, if it runs too long in the scheduler. So it doesn’t matter if the update will be fine or not. At 99%, a new version will be available. Also you can setup what to to, if the task fails. • I run it on boot. If it takes too long to get an ip (I’m also running a VPN on boot) it cant find a server and needs userinteraction. Hm, there is no real option to prevent that problem. The only option would be a batch-script, that runs the updater after time X, if application Y was started. Maybe sourceforge or other sites have a better solution to start programs after login. I’m sure, that this will greatly fix your problem :). PS still gives me a 404. Tested the download once more and tried it. No 404 arrives here with the 1.07. Maybe you still had the 1.06? No I quadruple checked now and its definately the 1.07. Checked fw and put it alone in a folder in ‘pristine/vanilla’ just to test it. Using the version that ‘passed all automated tests’. “Using the version that ‘passed all automated tests”? There is no option in “my” updater for that. Many other people in my board tested it and there are no problems at all. Just look at the.nsi – there are 2 adresses that will be checked for the update. Ok, i have to apology, that i never testet the feature for the stable download. It seems, that google removed the stable releases from their server… i see atm no point to solve this issue :(. Np, I appreciate you creating it. I made a better one. It blows away the competition so bad it should have it’s own post. Check it out here. Nice updater. But i think, many users don’t want a setup. Maybe you could do a portable updater? I would recommend that. Ok I’ll add a portable release with next update. For those that don’t know I have redesigned this application and it has become a very handy piece of software. No bragging but hands down it is the best Chromium Updater out there. You recently updated a link in your post for Chromium Updater (first listing in this thread) that links to my project that is also titled Chromium Updater, however the program shown is not mine. Just wanted to point that out.